See in this article how to create a simple CRUD program, inputing data in the HTML5 Local Storage and JSON. For those that don't know yet the Local Storage, this is a HTML resource that works, let we say, like a cookie that doesn't have expiration time. Or else, it is a local to store data that are not lost at the end of the section, thus, we can close and open the browser several times and the information will remain there. In this article, we'll see how to use the Local Storage in practical terms, creating a simple cadastration program of clients, with CRUD basic operations. We are not going to describe the design that should be used, but the functionaties. In the source-code available in the top of this page, interface is enhenced. localStorage.getItem(name): On the other hand, the getItem is used to recover a value stored from it's identifying key. JSON.stringfy(object): In order to store the data, we'll use the JSON format and this function transforms one object into string with a syntax adequate to the JSON. JSON.parse(object): Since the function parse transforms an item in JSON format into it's original format. From here, shall we create then our file functions.js and into it we'll use also the syntax jQuery, thus, all content shall be in the body of the function that is executed on the loading of the page. The variable "operation" will be used in order to define if the user is adding or editing a register. "selected_index" will serve to reference the register selected in a table. "tbClients" is ours "table of clients" and we start it with the value recovered from the Local Storage (saved with the key "tbClients"). In the case there's no content, then the variable will be initialized as an empty arrow. By default, the variable "operation" will have the value "A", in other words, may the user type the data and click in the button to save the information, a new register will be added, except when one have clicked in the table in order to edit it. It is important to observe that in the first column of the table, it is added two images that will serve as buttons of Edit and Delete actions, which event onClick will be treated by jQuery means in the future. The images "edit.png" and "delete.png" are available in the source-code, but also may be any two images (here was used 16x16 dimension images as for the buttons to appear discreet on the table). The List function should be called in the body of the main function, in order to the table be actualized whenever the site be reloaded. The routines used are pretty simple, Here we didn't concern ourselves about validations and error treatment, for instance. Therefore, in the source-code of the article the code is a little bit more complex, with some more functionalities. So, as for today that's all folks. I put myself at disposal to answer any questions about the article, you just need to comment right below. A big hug and shall we meet in the next article. If I wanted to take the stored data and post to a csv in the directory, how would I go about doing that? Hi Andrew. Try to send the data to a Server page/function (PHP, Java, ASP.NET, etc) using Ajax (jQuery has some functions to do this) and there you format the received content formata e save to file. Great tutorial about Local Storage, this was best explained tutorial I have saw. Hi, José. Thank you for you comment. I'm happy to know that you liked the article. Cara, Muito obrigado mesmo por ter disponibilizado o código fonte pra gente, que Deus te abençoe. Amém, Alex. Obrigado pelo comentário e fico feliz que tenha lhe servido. Um abraço. Fique com Deus. Hi, sampath. Thanlk you for your comment. 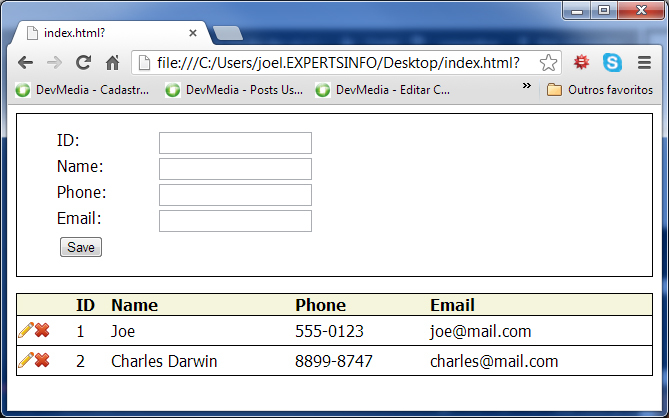 You can send the data to a Java page using Ajax. 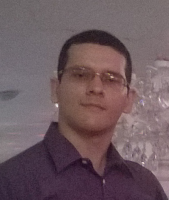 I recommend you use jquery's $.ajax method (or $.post). In the Add() method of the example, you can send the client object to your Java page instead of save it to Local Storage. And to retrieve the saved data, in the List() method you can also use the $.ajax method (or $.get) to request data from another Java page. Please, search for how to send and receive data to/from a Java page using jQuery Ajax. Best regards. Hi, jainik. Thank you for your comment. Where is the source code link? Hi, Tom. Thank you for your comment. I will take a look at this issue and when I find a solution, I post it here, ok? what is tbClients in this code?? Hi. See tht Listing 2: tbClients representes the collection of stored data. After being converted from JSON to object, tbClients becomes an array that we use in the other listings. Hi, I am unable to download source code. why i cant download the source code? Great article!! Can you send me the source code on sito-web@hotmail.com please? Thank you!! Great article!! Can you please send me the source code? manchoguz@hotmail.com. Thank you!! Thank you, German. I sent you the project. Hola, Melissa. Tu puedes descargar el codigo fuente en el link "SOURCE CODE" que se encuentra en topo de la pagina. Sir...Can you please give me the entire source code for saving html table data? I want the data to be available even after closing/refreshing of my web page. its really awesome ;) could you please email me source code? Hi! Thank you for your comment. You can find the source code in the top of the page. Hi, thank you for your comment. You can download the project by clicking in the "SOURCE CODE" link at the top of the page. Best regards. Hellow sir, thank you so much got it already, sir, is it possible to save the data value from table to excel or .txt file or .csv? sorry for my english sir.. thank you again. God bless po..
Hi! Yes, it is possible, but instead of saving the data in Local Storage, you have to send it to a "back-end page", that may use PHP, Java, Python, etc. To send the data to the server you need to use Ajax. Best regards. Hi! I sent you the source code! Thanks for reading. Hello Sir, Plz send me the source code of this at vishal.pawar75@gmail.com. hello sir. can you send me source code: kundal92@gmail.com It is good to help me. thank you so much for this post. Where is the source code for this tutorial? Hi, in the top of the page, above the article's title, you can see a link SOURCE CODE. Thanks for reading. Please, provide me an email to which I can send the source code. Regards. Please, can you send me the source code on snow_peke@yahoo.es please? Thank you!! Sent! Thank you for reading the article. Thank you, Dmytro. I sent the code to you. Could you please put the source on dropbox and post the link her? Thanks! Hi, can you please send the source code to chykalodmitry@gmail.com ? Hi, can you please send the source code? Hi, great tutorial! May i have the source code my email is: celustia.lewdenberg@gmail.com. thanks! Hi! Using the localStorage (as we do on the article) object the saved data will remain even the browser is closed and reopened. If you use the sessionStorage object, the saved data will be deleted at the end of the session. where is the link to download the source code for this article?